Diamond heart engagement rings represent more than just an engagement. They are popular because the heart represents love, and has a more symbolic meaning than any other shape. This is the main reason many couples choose diamond heart engagement rings. The symbolism of the heart is strong and enduring. Have you ever wondered who wore the first diamond engagement ring? The credit goes to Maximilian I of Austria. Lore has it that in 1477, Maximilian I presented his bride to be, Mary of Burgundy, with a diamond engagement ring. Diamonds weren’t easy to obtain in 1477, so the story of Maximilian I is more than likely true. If anyone could’ve obtained a diamond back in 1477 it would’ve been someone of royal blood. However, no one knows when the first diamond heart engagement rings were cut. According to whom you ask, some say that the engagement ring given to Mary of Burgundy was heart shaped. It’s not clear who invented the cut. People can’t even agree on who invented diamond cutting. Some believe that diamond grinding, an early form of diamond cutting, originated in India, but not because they used diamonds for jewelry. Diamonds were discovered in India in 800 B.C. They were prized for their beauty and rarity, but some people thought they had magical qualities. So, diamonds were often ground and used for magical purposes. Many believe that diamond cutting as we know it originated in Europe. It wasn’t uncommon for European visitors to transport diamonds from India. The diamonds would be cut in European mines and sent back to Indian royalty. People continued to experiment with diamond cutting, and made a significant breakthrough in the 17th century. Diamond cutters invented a crude cut called the Rose Cut. It was given that name because the diamond resembled a rosebud. This cut remained popular until the early 19th century. As with Maximilian I and Mary of Burgundy, the popularity of diamonds has always been influenced by the wealthy and well known. Famous people and celebrities have always influenced fashion by setting trends. And when it comes to diamond engagement rings, the influence is just as strong. As long as celebrities cherish diamonds, the public will follow. And celebrities do love their diamonds. Two celebrities known to have diamond heart engagement rings include Elizabeth Taylor and Joan Collins. Taylor once owned an antique 17th century diamond heart engagement ring. Joan Collins received an antique diamond heart engagement ring in a nineteenth century setting. These are examples of very expensive rings, but there are many less expensive options available. 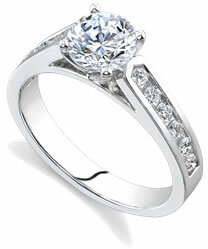 It shouldn’t be too hard to find diamond heart engagement rings for purchase. Jewelers can cut diamonds into just about any shape imaginable. It’s even possible to find loose diamonds already cut into a heart shape. All you have to do is pick your setting. If you spend a few hours searching online, you’ll find a nice selection of diamond heart engagement rings from which to choose. Novori has heart shape diamonds available for you to select from. If you can't find what you are looking for, feel free to give us a call. We would love to help you find a diamond heart engagement ring of your dreams.